James Cameron's vision of the future in his 1984 classic, The Terminator, portrayed a rather harrowing world where a bed of skulls lay beneath the tread of cyborgs. Lasers lit up the polluted skies, playgrounds were vaporised, and humans were brown bread. That year was 2029. Here we are in 2016 (some 13 years shy) and already the machines are taking over. Supermarkets are a sea of self-service and cars will soon drive themselves. With Schwarzenegger too old to come and rescue us again, how will the world cope when the machines threaten our livelihoods? Only humans could invent something so magnificently potent in its ability, that we've inadvertently sealed our own fates. Nuclear warfare was (and still is) a good example of this. But now it seems we're inventing ourselves into an inescapable corner of redundancy. Even Neo can't help us now, can he? Although it might feel like technology is taking over every aspect of our lives (just ask the Pokemon GO zombies), we are still far from succumbing to the machines. So before we go into what can be done to protect us against the harmful effects automation could have on our careers, let's take a step back and recap on the origins of technology. As terms go, technology is very broad. Theoretically, technology goes all the way back to the 4th millennium BC, when one of our most ubiquitous inventions was born - the wheel. Although it might not represent technology as we know it today, the effect the wheel has had on our culture is a great example of what technology is as a concept. The first thing that probably springs to mind for most people when they hear the word 'technology' is the idea of advancement and evolution - the ability to make a task easier, instant and more precise. These are fair assumptions, but not always accurate ones. From an industry perspective, technology can advance at different rates (depending on levels of investment), meaning that certain jobs are less at risk from 'full tech take-over'. One such area is that of androids (no, not the phones). Robotics that try to emulate human actions still have a way to go before they are anything like the T-800 cyborgs. We're still used to seeing fairly crude robots tripping over thin air, attempting to pick up a glass but dropping it, trying to understand human speech and failing miserably. However, one thing we have been able to do, is make a robot which can perfectly emulate England's current goalkeeper, Joe Hart. For the time being then, humans are far better at being ... erm ... humans. "The computers NASA uses now for missions are much smaller and more powerful than the computers used for Apollo missions. Your cell phone has more computing power than the computers used during the Apollo era." So if technology keeps evolving at this frighteningly fast rate, where will we be in another 50 years? Unemployed? Well probably not but there will be some truth in this if we fail to prepare for it. So let's now take a look at the positive aspects of robots and how we can coexist in a laser-free future. Of course, humans wouldn't invest so much time into development and research if there wasn't so much potential on offer. And that's exactly what technology gives us: potential. Imagine the potential of being able to hold important 9am meetings in the back of your car while it drives you to the office. Or the ability to fly from London to New York in just one hour. These are the benefits technology brings with it. Things that make our work easier and more efficient. Things that remove the mundane and repetitive out of our lives. 99% of jobs these days would seriously struggle to even exist without any form of technology. So how exactly does it enrich us? Quite some time ago, this article would have been written with a goose feather and sent to you by carrier pigeon. Nowadays, whether you're Ian from Tamworth or Pablo from Ecuador, you can make a couple of clicks and find any information you want. The internet is arguably our greatest technological development in history. Its ability to connect everybody in the whole world, share yottabytes of information, and assist us with everyday tasks, is nothing short of phenomenal. The way in which the internet just keeps growing means that it's now the go-to source for our history, entertainment and even shopping. Our everyday lives, inside or outside of work, are totally dependent on it which (as we'll discuss later on) isn't necessarily a good thing. As humans, we are very good (most of us at least) at recognising our limitations. As such, we constantly use technology and automation in ways to get around that - this being no more evident than in the construction and manufacturing industries. If you've ever seen a modern-day production line, you will realise that most of it is controlled by very precise machinery - leaving us humans to just pop in the final bolts and screws. The same goes for heavy machinery and agricultural engineering - with the strenuous tasks of earth moving and crop gathering now as easy as pressing a button and moving some joysticks. No, I'm not just talking about your scientific calculator from high school. These days computer algorithms can determine all kinds from just minutes of analysis. Whether you're sifting through CVs with ATS software, or trying to find a perfect recruitment agency, these algorithms are able to deliver exactly what you want within a matter of seconds. All kinds of other measurements can be made too, from distance, weight, proportions and angles - making architecture and design careers much easier. Don't get me wrong, not every decision a computer makes will be so precise. With the first driverless car fatality happening in July (something which the Guardian spookily predicted just 15 days earlier), questions are starting to be asked about how much we rely on technology and automation, and whether we should invest so much trust into it - especially when lives are at risk. For all of the simplistic beauty and automated ease they bring, robots also deliver many negative factors to our working lives. In making certain tasks automated, we put trust into the machines and absolve our responsibilities. Less responsibility leads to less engagement, which can then cause a lack of job enrichment, fulfillment, or any other good thing ending with 'ment'. As technology improves and its use in the workplace expands, the demand for high-tech talent drops. The simulation of the study found that 68% of high-tech workers would end up in the service sector, earning circa 14% less than they did previously. Increased workplace automation could produce "economic misery". Specifically, three consequences were found to be highly probable: "A long-run decline in labour share of income, tech-booms followed by tech-busts, and a growing dependency of current output on past software investment." As a bigger picture for the long term, the study concludes that the impact of widespread automation in the workplace would see "national income increase initially, but then fall by as much as 17%." 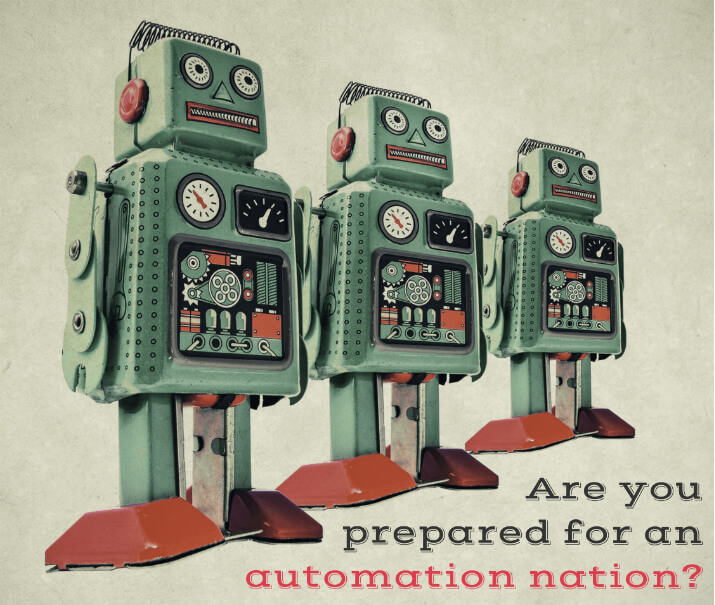 So while companies may look on automation as a way to cut costs in certain roles, they are potentially shooting themselves in the foot further down the line when the economy takes a hit. The Bank of England have warned that "15 million jobs in Britain are at risk of being lost to an age of robots." 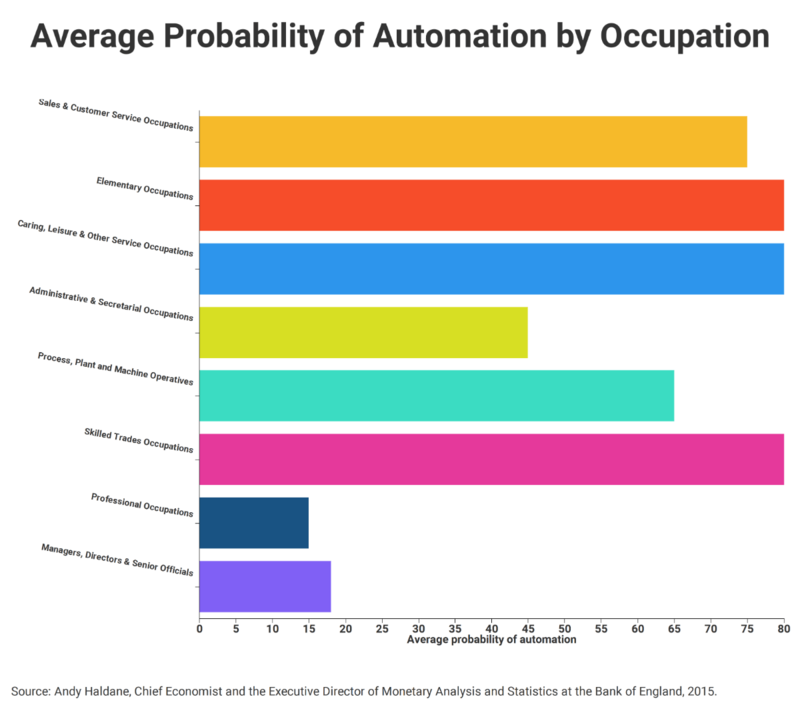 The fact that machines can now substitute cognitive tasks as well as manual tasks means that half of the jobs in the UK will be at risk of automation in the near future. The sensational irony in all of this is the fact that there'll likely be massive unemployment, meaning people don't have the money to buy any products made by these robots. Although robots are apparently 90% cheaper than full-time employees over the long term, the short term set-up costs are huge. This means that, unless you're a company turning over hundreds of millions per year, acquiring a robotic workforce can prove far too costly. Should a company be wealthy enough to invest heavily into automation, the timescale of recuperation on investment could take years - impacting on profits in a time of economic uncertainty (the aftermath of Brexit). Something that humans do much better than any robot is multitask. Any given machine needs multiple components to perform one task - whether it's transporting parts on a conveyor, applying labels or packaging products. 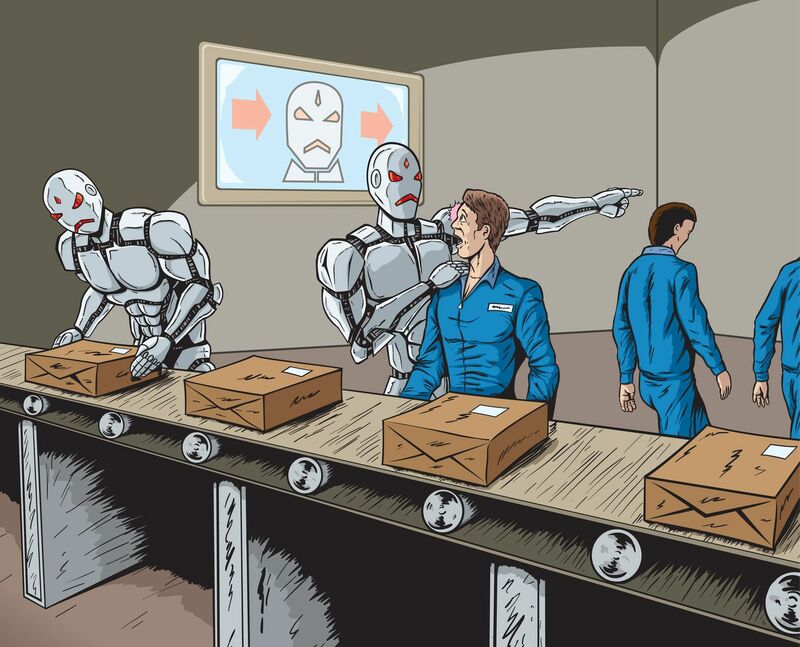 Albeit at a slower pace, a human can perform all three of those tasks with their hands - removing the need for multiple machines to achieve the same end product. What knock on effect does that have? Well it would mean less pollution in the world for one. Every machine added to a workplace will no doubt require some level of chemical maintenance (oiling, electricity etc.). What might seem like a minor output with one machine, a fully automated workplace would become a palace of pollution. What industries are most / least at risk of automation? In a bid to understand which industries and job roles are most affected by the threat of automation, we managed to speak exclusively to one of ITV Studios' top Producers. Currently 4th in our Social Recruiter 100 league, ITV see minimal automation threat to their studio roles in the near future. This goes to show what a good job they are doing recruiting humans, so they don't even need robots! 1. With big companies such as Sky News and Sky Sports going down the automation route in their studios, are all of ITV's Camera Operators and Vision Mixers still humanised roles? I work on a predominantly studio-based show and all of our cameras are manned. I can see the appeal in automated cameras to save on budget and time but often with difficult creative roles such as a Cameraman, it requires a great deal of flair and creativity, something which would be hard to recreate with a robot. In all honesty, I've never really given it a thought. If you spend your life worrying about what could be you'll never get anything done, and if you don't get much done then the need to replace you for a robot will definitely increase! But in all seriousness, I think some robotic automation in the future can't be that much of a bad thing. Pretty much all of the roles here require a lot of interaction with other people, you just can't replicate that. 3. Are there any elements of your current role as Producer that would benefit from a degree of automation - or would you say it is (and always will be) a hands-on role that requires a significant human element? I think the role has been made much easier over the years with the assistance of internet services and online organisation tools. As a Casting Producer, a lot of our applicants can now apply through the likes of Skype instead of travelling to meet the Production team, which has been a big help. Again, a lot of the job requires human interaction and I just don't foresee that ever being recreated to the standard it needs to be. 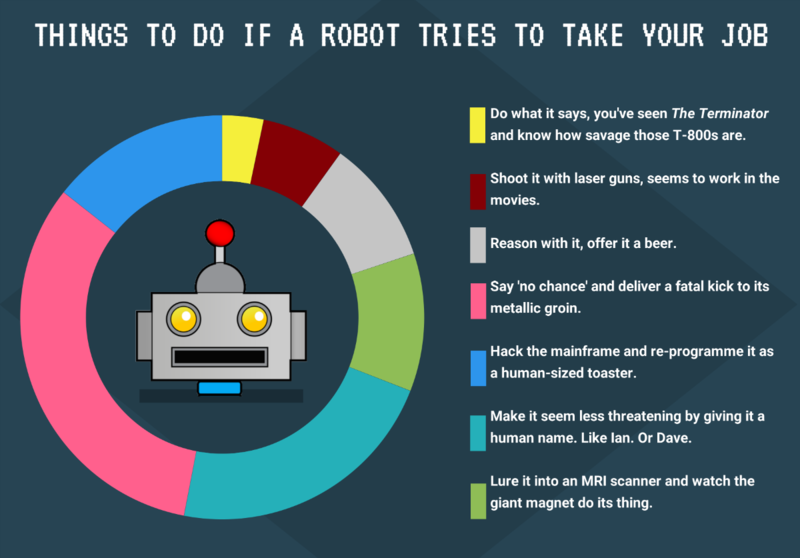 It's safe to say that roles involving more creativity are generally more difficult to replicate with a robot. However, even this is being tested in Japan, as there is a new 'AI Creative Director' battling a human Creative Director for supremacy in developing an advert for some mints. Whoever comes up with the most refreshing concept (see what I did there) will win. For the sake of the human race, let us all pray Mr. Kuramoto produces an absolute blinder. So how can we postpone Judgement Day and stay relevant? For the time being at least, we are safe from a robot takeover; but we can't get too complacent. Making sure we prepare for a future that has a much larger automated workforce is crucial if we want to remain the dominant species. How do we do that, you ask? Well we should look to become more well-rounded with our skills, re-train if necessary, and express every ounce of our personality through our jobs - as the one thing robots don't have is personality. The idea of re-training might seem daunting for some people and we only recommend this as an emergency, 'future-proofing' step to take if your profession is particularly at risk. If you're unsure where to even begin with this, check our blog in a couple of weeks for part two of this article, in which we tackle the idea of universities and schools offering all-new courses, which soft skills transcend multiple careers, and how a future coexisting with machines is totally possible (and actually quite exciting!). Failing that, I'll meet you in the bunker and we'll fight the titanium tyrants together!